I t has been medically proven that people who perform physical activity regularly are significantly less likely to develop a number of serious health conditions (illustrated below) including heart disease, dementia and certain types of cancer. wellbeing to the same extent that we do our physical health and being active can help. 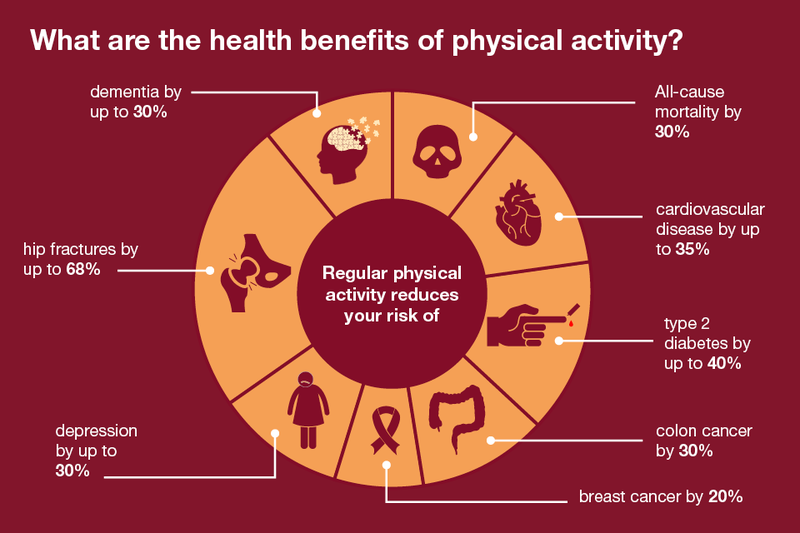 There is evidence to suggest that being active can reduce your risk of developing dementia by up to 30% and it can also help improve your mood. We all feel down from time to time. If this happens to you, exercise can improve your mood by bringing about positive chemical changes in the brain, boosting your own self-image and giving you a sense of control. The positive impact of the social aspects of taking part in group exercise programmes should also not be underestimated. Feeling low occasionally is part of the normal trial and tribulations of modern living, but if the feelings persist for more than two weeks, you may be suffering from depression*. Physical activity has been shown to be very helpful for some people with mild to moderate depression and has been proven to reduce the symptoms by up to 30% when performing 45 to 60 minutes of exercise, three times a week. *If you’ve been feeling down for more than two weeks, see your GP to discuss your symptoms. They can tell you about the treatments available and what might be the best option for you. If you have depression, motivation and energy levels might make it difficult to be more active, but if you persist, you are likely to see the benefits. You don’t need to spend hours in the gym if you don’t want to. Instead find something that you enjoy that you will be able to fit into your life and sustain – for example, gardening, dancing or a walk in the park – every little helps. To find out more about stress, anxiety or depression visit the NHS website. Read more about how being active helps with mental wellbeing here.